My first post is a sweet one. The no-fry,no-ghee Indian dessert loved by most and relatively low-calorie as far as desserts go! Hailing from the eastern state of West Bengal, these light-delights are so loved that one sees rasgulla eating competitions at weddings. I have seen a participant, who eventually was declared the winner, down three dozen at a go!! Here is a recipe very close to my heart, perfected after more than half a dozen trials till I reached close to perfection. Rasgullas are now almost a weekly affair in my house. Two months back I wouldn’t have dreamt of making them at home!! Let me warn you-making rasgullas is very addictive! Once hooked to making them, you just aren’t able to stop! Tip- Off late I have started using curd for splitting the milk. You don’t need to wash the chhena and it gives perfectly round rasgullas. Bring the milk to boil, add 1-2 tbsp lemon juice gradually so that the milk mass and whey separate completely.Add 10-15 ice cubes. Rest for a minute. 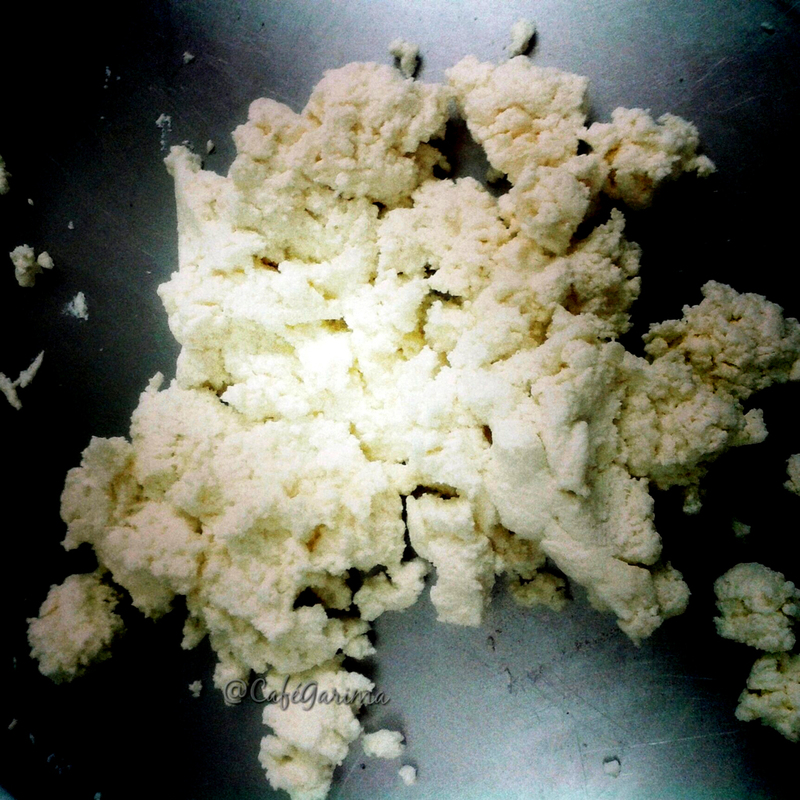 If using curd, simply keep adding the curd till the milk splits. 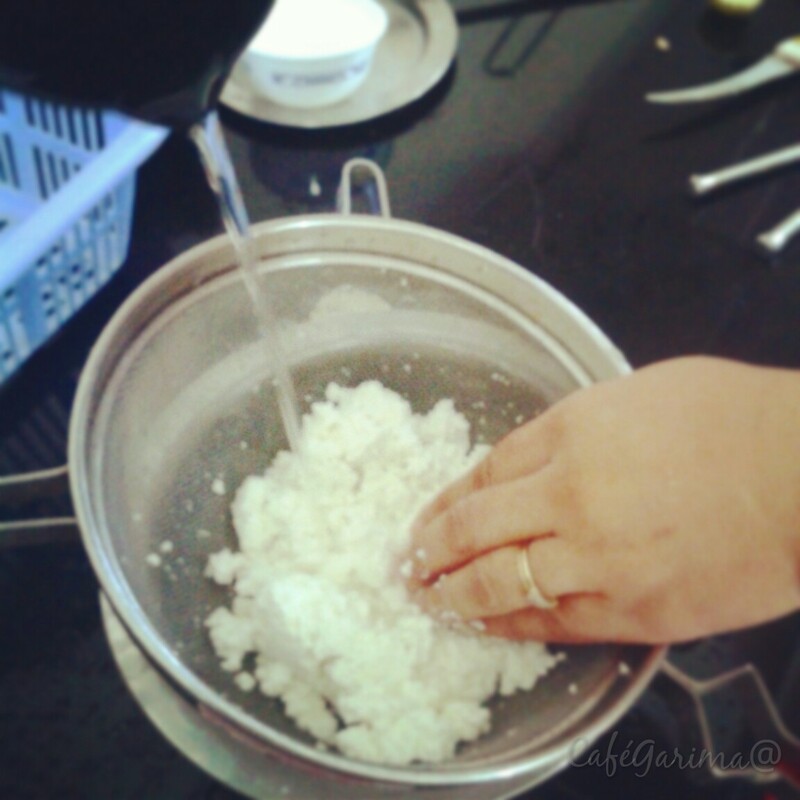 Strain and drain the chhena well and proceed to make rasgullas. No need to put the ice cubes and wash the paneer! 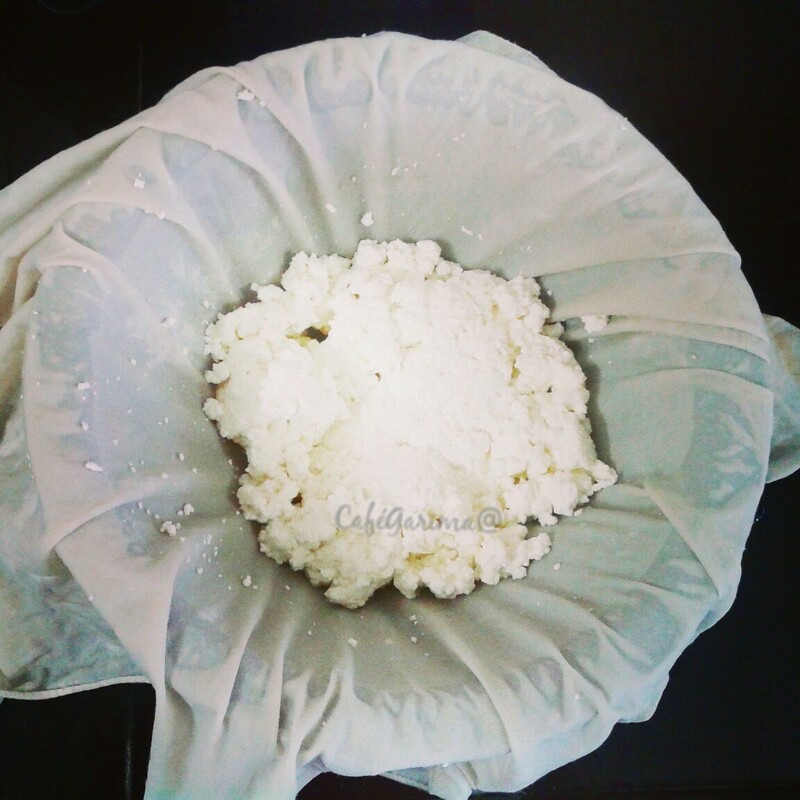 Strain in a colander lined with muslin/cheesecloth. Wash thoroughly with fresh water to remove the lemony sourness. Drain the water by squeezing. 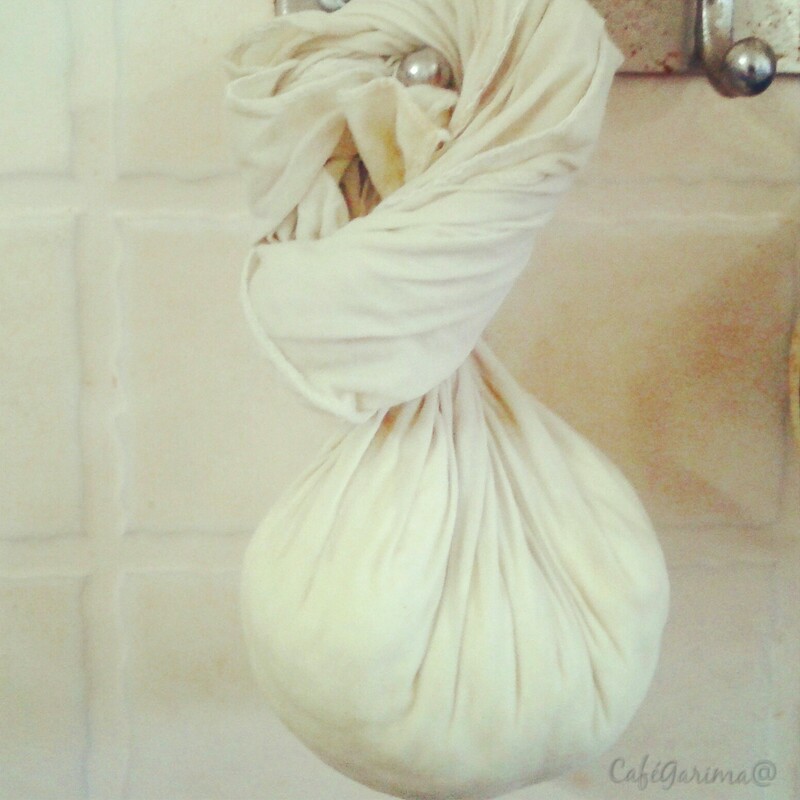 Knot the muslin cloth and hang it to get rid for any excess whey/liquid.After about 10-15 minutes, remove. The chhena you get will be crumbly like in the picture below. If it is too wet, it is not drained well and will be impossible to knead. So, make sure chenna is crumbly and slightly dry and yet a little moist. Rub the chenna with fingers and heels of the palm till the chenna gives out some fat/ ghee/chiknaayee. It takes me about 5- 7 minutes to get there. 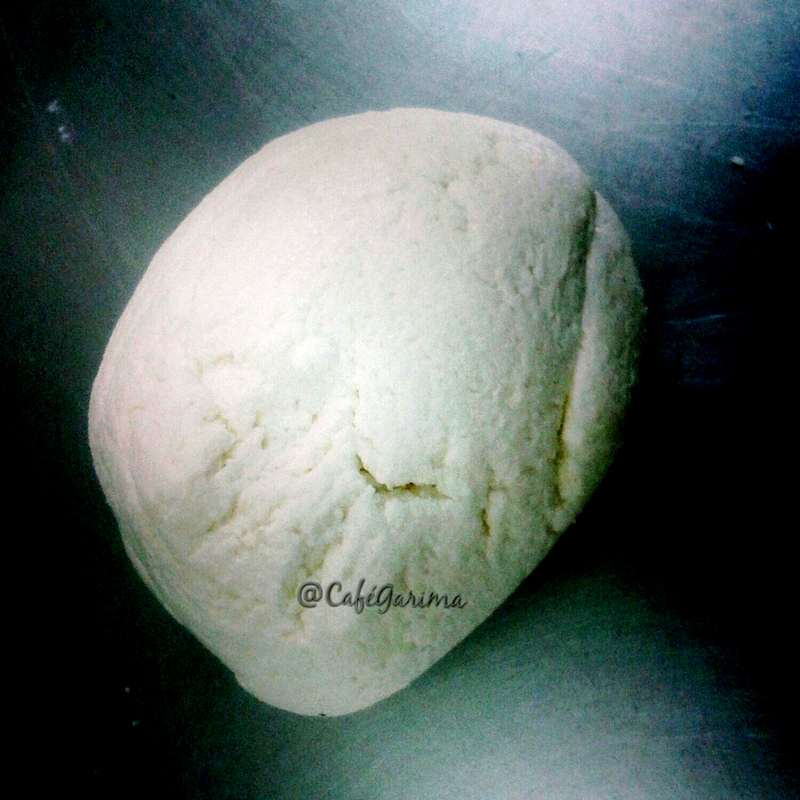 By now the chenna is like a dough ball that comes together easily, neither too hard nor too soft. 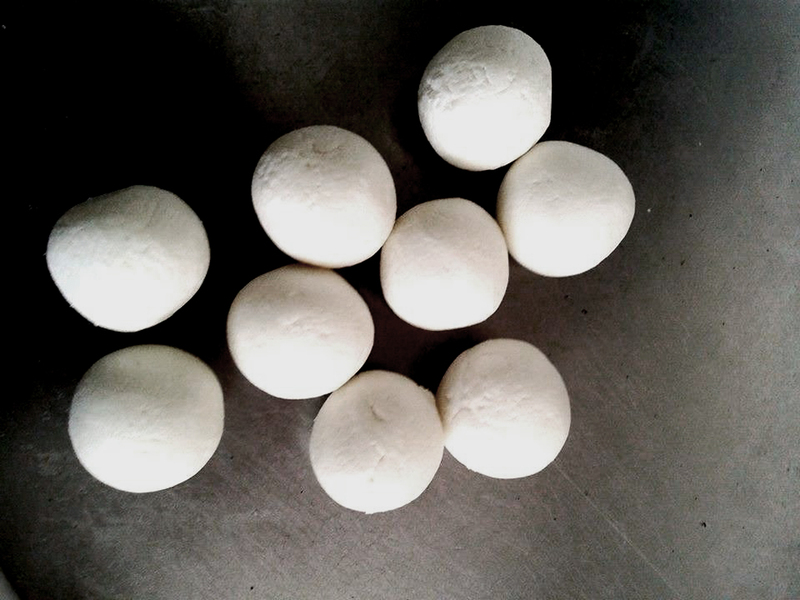 Take pinches off the dough and make small balls, you should get about 15. Remember, they are going to double up on boiling so size them accordingly. While you make the paneer balls, bring to boil 5 cups of water with a cup of sugar (light sugar syrup). Add half a tsp fine cardamom powder. Just as the syrup comes to a rolling boil, add in the rasgulla balls. Boil covered for 12- 15 minutes on medium flame. I make my rasgullas in two batches so that the rasgullas get enough space in the water to expand and also keep their round shape. If the syrup is less or there are too many gullas in the liquid, they will either become flat or lose their shape. You may uncover to check every 5 min minutes. To check if the rasgullas are cooked, drop one in plain drinking water. If it sinks, it is done. If it floats, boil for a couple of minutes and check again. Switch off the gas. Drop in a plain glass of water. If it sinks to the bottom, it is done! 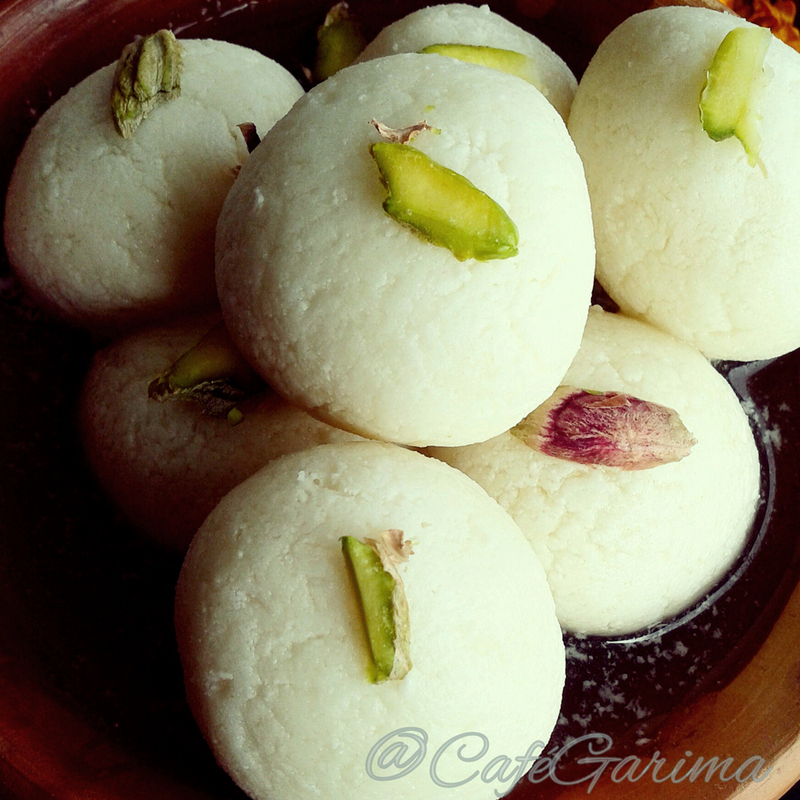 Remove the rasgullas from the plain water, squeeze gently and drop into the sugar syrup. Chill for three hours. You may top with some finely slivered pistachios and almonds. Just tried one- perfect! No lemony taste, just the right amount of sweetness, no kich kich sound when you bite in. People living overseas should give them a go with 2 % milk. 2. I remove the malai/cream and then proceed to make chhena because my trial with full cream milk gave me greasy Rasgullas. But your choice, you can go with full milk. 4. Washing the paneer THOROUGHLY is vital, else you get the lemony taste in Rasgullas. I pour 3-4 glasses of drinking water and wash all of it with my fingers- very nicely! 5. Draining the chhena right is again,very important. Too dry and the Rasgullas go dry, too moist and the Rasgullas scatter in the syrup. This comes with handling the paneer. But a couple of attempts and you get it right. 6. I do not add any binder– sooji,maida,cornflour or arrowroot. Nothing against binders but I wanted to do it without them for the fasting community in my family 😉 Also, I got softer Rasgullas without the sooji/maida- yeah, I did try making them with both. 7. Kneading well is important! The chenna has to be crumbly to start with. Knead it till you get a smooth non-sticky dough like consistency. Knead till it leaves out some ghee/fat/chiknaayee. And stop then. 8. Make smooth, crack free chhena balls. 9. I transfer the chhena balls to water at room temperature to stop the cooking process. This also ensures I don’t get chewy Rasgullas due to over cooking in the residual heat. Keeps their shape well while I cook batch 2 of the Rasgullas in the same syrup. 10. I cook the chenna balls in light (less sweet) sugar syrup to get spongy Rasgullas. Later add more sugar and water to the SAME sugar syrup. Then cool the syrup to room temperature and add the cooked chhena balls which were put into water at room temperature. We are using the same syrup and not making two syrups here. 11. I always leave them in the syrup for 3-5 hours before serving so that they soak in the sweetness. Eating immediately is fine too, only they will be little less sweet. 14. Sometimes Rasgullas shrink after they boil and double. Usually happens because of the wrong milk in my experience. They do shrink a wee little bit once taken of the heat, but not remarkably so. 15. 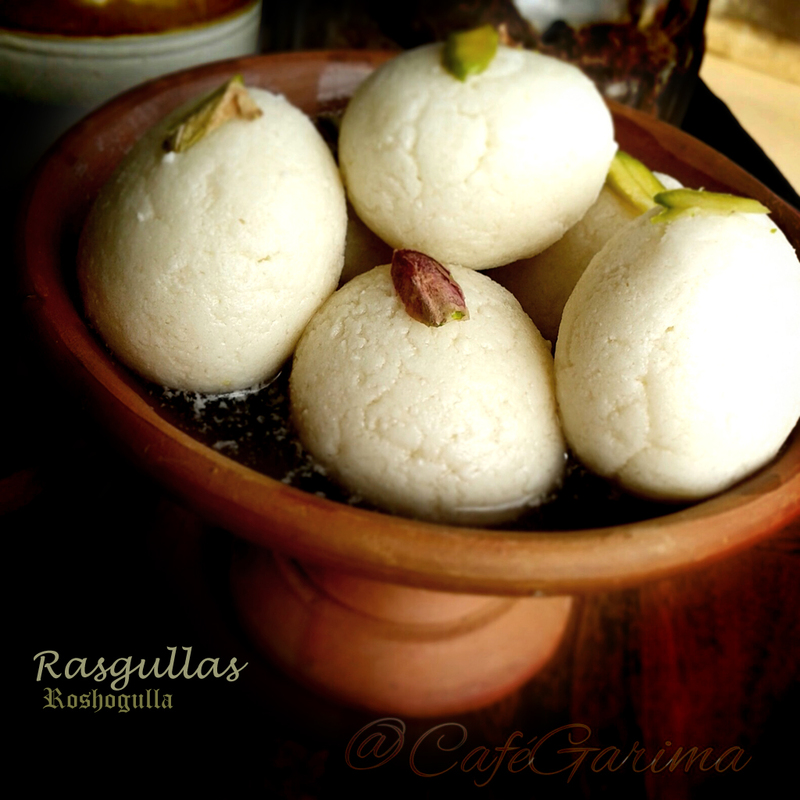 If you get flat or shapeless rasgullas, it is because they aren’t getting enough space to expand. Use a deep and wide vessel. I make the rasgullas in two batches so that they have enough space and also because it gets done in less amount of sugar syrup- no wastage. If you want to make them at one go- you may double the amount of sugar syrup. 16. I keep the sugar low in the rasgullas. If you like them sweeter, please add more to the syrup after having boiled the rasgullas once. If you feel they are less sweet even after the second soak for three hours- remove the rasgullas, add sugar to the syrup, give it a boil, cool and soak the rasgullas again for a couple of hours. Next A simple focaccia- my first bread ever! I tried this recipe today and it has helped me to a large extent and I am thoroughly happy with the result. Thank you Garima. Dear Garima, thanks for the recipe. They came out nice and soft but for some reason they are all most flat. There was plenty of syrup and I didn’t put too many. Doubled up in size but are flat. So I’m turning them into rasmalai. Could you tell me where I’m going wrong. Try with another brand of milk. Try adding a tsp of sooji while kneading. Incase we take 2 litre milk should we double the amount of sugar also? Thanks a lot for a detailed recipe! I tried it out yesterday and got the best rasgullas ever!!! Special thanks for the tips at the end. I think these tips made all the difference! 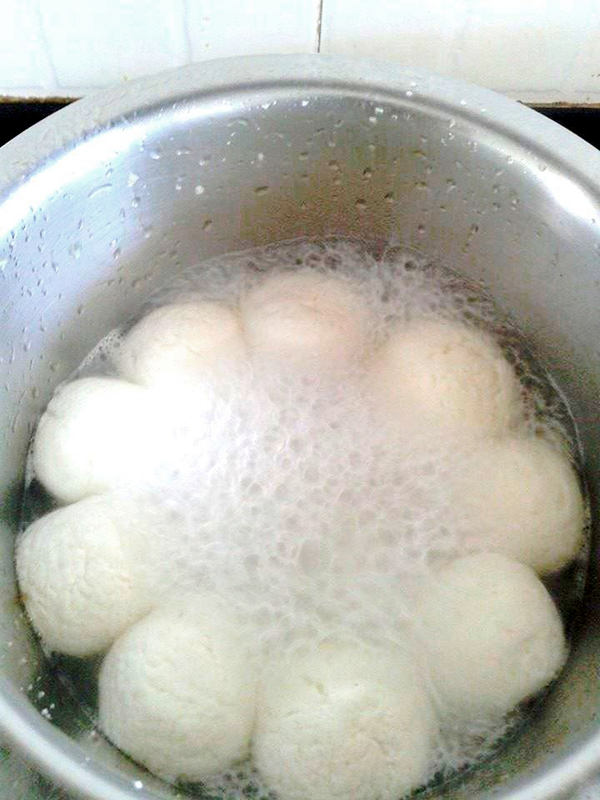 Hi garima ji; while boiling the rasgullas they wer nice and round. We closed the lid and checked after 10 mins. They become big in size but some broke.. Wat cud be the reason? Out of 8 rasgullas 4 broke and other 4 had little cracks. Plz let me know so that we take care in future. Hi , Thanx a ton for this amazing Blog. 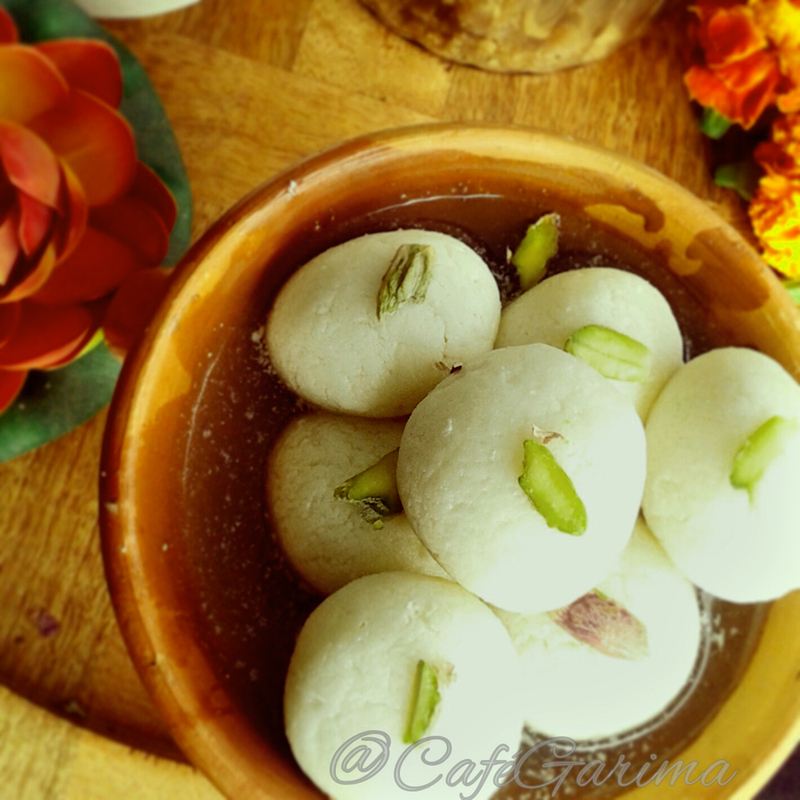 i have tried to make Rasgullas they came out nice but after reading all your cooking steps i am sure next time i will be able to make better thank you. Thanks for visiting Naeema 😀 Happy cooking! 1) They were not spongy. . I am sorry Shikha as the milk is different everywhere, the results differ. Sorry, I have never tried that. 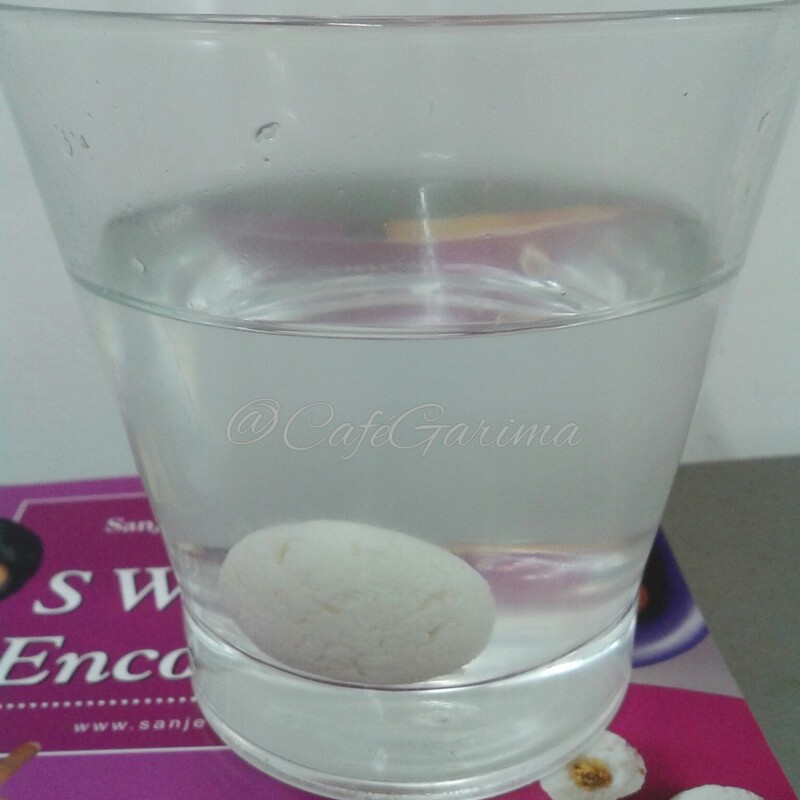 a) rasgullas does not double its size like urs but it did pass the sink/float test. Kich kich happens when you keep boiling the milk even after it splits. As for doubling, try a different kind of milk maybe. I live in Bombay and use Aarey milk to make them. They come out well. Sorry to hear that dear. But really I’m not sure what makes them work. I follow the exact same method to make them as I have shared in the blog post. It works 9 times out of 10. But only problem was they have a taste of raw paneer and chee chee sound. The reason for both the problems is over boiling of the milk. You need to stop as soon as the milk splits. Try with another brand of milk and see. It’s all about the milk. Hi Garima,can I use pasteurised and homogenised milk to make rassgullas .it’s called pride of cows milk,comes in 1lts plastic bottle supplied early day from Pune to Mumbai. Another thing that after boiling the rassgullas ,you said drop it in room temp water and gently squeeze out the water ,won’t it get compressed and go small??? You haven’t drained it enough. Now I don’t think anything can be done. Please drain more when you try the next time. I am glad you replied so fast.. 😊.. I am afraid nothing can be done now. Ha ha yaah! Bhurji is perfect! See you need to find the balance. Neither too dry else syrup won’t get soaked, nor too moist, else they scatter. I boil them in light syrup and then transfer to plain water. Later add them to the same syrup. Keeps the taste uniform. In case you found it too sweet, reduce the quantity of sugar. Hi Garima, they become rather flat any idea why? Anyway I made rasmalai out of it. Treasure this post and the tips ,abs invaluable …TFS so generously ! Hey Garima, how are you? I am wondering if you can measure the temperature of syrup when you add rasgullas to boil. Reason for asking this is because “medium flame” can be quite unpredictable especially for users like me who live abroad. Our gas burners are very different to those in India, so flame that comes out on our burner;s medium is not so high. So temperature of syrup on medium flame would be great. Hello Garima….. I tried the recipe but only one change I did is using market paneer instead of homemade chena but I am facing the problem of non increase in the size while boiling. 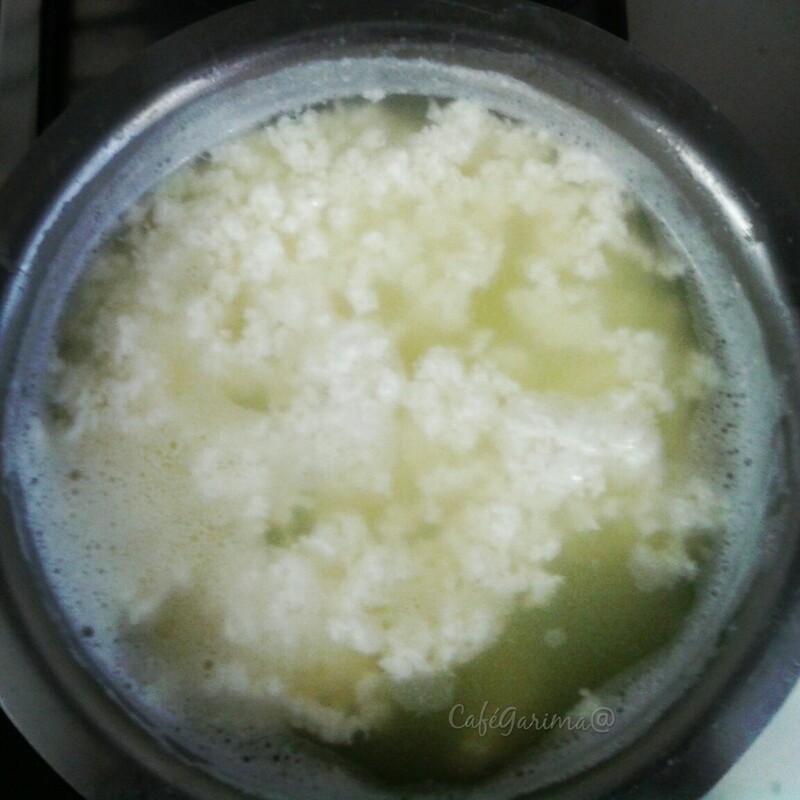 Have you ever tried making rasogulla with paneer? Hey I’ve never tried with ready made paneer. Hello garimaji I have made ur Karachi biscuits, n they are a hit in my home. Thanks for d recipe. I tried rasgulla, 3 times but they flatten. Today tried with cows milk, but still flatten. Please guide where I must b going wrong.